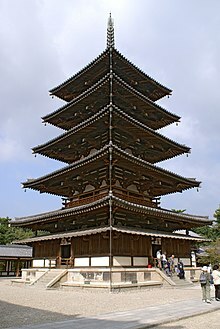 A pagoda is any kind of tower with multiple eaves. They are common in eastern and southeastern Asia. Most pagodas are built for religious purposes. They are usually Buddhist. Some are used as Taoist temples. The modern design for pagodas comes from the stupas of ancient Nepal. These were first built during the 3rd century BC. This kind of architecture has spread across Asia, taking on many differences as details specific to different regions are made a part of the overall design. Stupas were used to house Buddhist relics. Later, the architecture of Chinese towers and Chinese pavilions blended into pagoda architecture. This eventually spread to Southeast Asia. The pagoda's original purpose was to house relics and sacred writings. ↑ The Columbia Encyclopedia, Sixth Edition. Columbia University Press. ↑ A World History of Architecture. Michael W. Fazio, Marian Moffett, Lawrence Wodehouse. Published 2003. McGraw-Hill Professional. ISBN 0-07-141751-6.